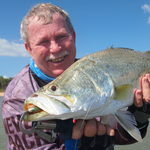 Gary has fished in every state and territory in Australia, except for NT for over fifty years and early in his fishing career he has targeted bream, whiting, flathead, leatherjackets, luderick, john dory, flounder, crabs, silver trevally and mulloway in the estuary’s and bays. In his teens Gary brought his first boat and started fish out to sea on the south coast of NSW where he could chase snapper, tuna, morwong, pinkies, leatherjackets, mulloway, bonito and many other fish species. Not being content with that style of fishing Gary took up rock and beach fishing and targeted drummer, snapper, bonito, tuna, bream, luderick, tailor, Australian salmon, whiting, dart and kingfish of many a deep water ledge and washes around Australia. Over the past 22 years Gary has taught many anglers how to improve their fishing ability in his “How, Where, When and Why to Fish” classes throughout tackle shops in Sydney. Gary is currently writing for state and national fishing and boating magazines. Gary also consults to various boating and tackle industry companies. In 2002 Gary has his first book published (Fishing Sydney’s Waterways) by AFN. This was then followed by four more books: 2005 - Beach and Rock Fishing, 2007 - Australia’s Favourite Fish Species, 2010 - Fishing Guide to South of Sydney and in 2013 - Land-based Fishing Guide for Sydney Harbour. Gary has been involved with Pflueger/Shakespeare now for 24 years as one of their Pro Anglers, who tests out some of their range of fishing tackle and also writes technique articles for the Shakespeare web site. Gary also writes for NSW Fishing Monthly, Australian Fishing Network, Kaydo Fishing and Weekend Notes.